There is a reason, Guha says, why as a historian he doesn’t want to get too involved in Kashmir, the Maoist insurgency or, for that matter, even conservation movements. Apart from the obvious hubris of believing that an outsider can ‘speak for’ a community or a victim, Guha thinks it is far more challenging and nuanced from an intellectual standpoint to ‘listen to’ or ‘speak to’ victims as opposed to ‘speak for’ them. Casting himself firmly on the side of traditional historiography as against postmodern ones, that celebrate dissent and flux for their own sake, Guha agreed with Edward Said’s notion that scholarship has to always oppose the guild mentality that unquestioningly privileges notions like ‘country’, ‘citizen’, ‘community’ and the like above everything else. But it is also the scholar’s task, Guha asserts, to discern when an attack on these notions are warranted and when not. The current ‘seditious’ charges on Kashmir, emanating from certain quarters, in his view, certainly aren’t. I was dismayed to see the lead story in your newspaper today (29th October). I never called Arundhati Roy a 'joke', and yet a fictitious remark has been made into a sensationalist headline. I did, as correctly reported, question the wisdom of Ms Roy's associating herself with Islamic theocrats in Kashmir. However, the false and misleading headlines have converted a substantive issue of political judgement into imagined rivalries between individual writers. When the Mirror’s reporter came to interview me, I insisted that he record the conversation. He did not do so, hence perhaps his resort to mistaken transcription or a fervid imagination. I am known to choose my words with precision, and do not ever use crude or comic language to characterize a person or idea. Ms Roy is not a ‘joke’, but a vigorous and somewhat one-sided polemicist. Incidentally, the interview was granted on the express understanding that it was to be about my new book, Makers of Modern India. 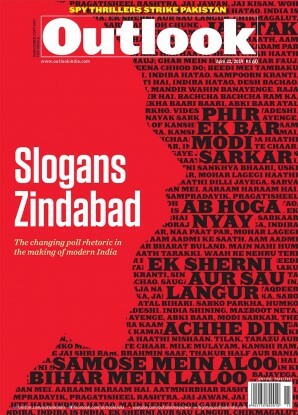 I wish the report had focused more on the book, which is about truly remarkable Indians, and less on the rivalries between two rather inconsequential writers. As a work of analysis, it was unoriginal: Kothari and company had been there before her. As a piece of literary craftsmanship it was self-indulgent and hyperbolic. Still, to criticise the essay would be to let down the side. Might not her name and her fame attract to the "cause" the undecided upper class, men and women who would read Ms. Roy in Outlook but who had never heard of Nirmal Sengupta or the Economic and Political Weekly? To suppress my reservations was not easy, for I had been intensely irritated by Ms. Roy's previous venture into public interest journalism: her polemic against the nuclear tests in 1998. There too, I was on her side, "objectively" speaking. Yet her vanity was unreal. Ms. Roy quoted, without irony, the judgment of her friend that after having written one successful novel she had seen it all, that a barren stretch of life lay before her until the final meeting with her Maker. She spoke of how she had disregarded the advice of those who insisted that the tax man would come chasing her were she to write against the bomb. A month before Ms. Roy sat down to write her piece, 4,00,000 adults had marched through the streets of Calcutta in protest against the Pokharan blasts. Were their homes all raided by the Income Tax Department? The anti-dam essay had its signs of self-absorption too. Its opening scene, of Ms. Roy laughing on the top of a hill, seemed a straight lift from the first lines of that monument to egotism, Ayn Rand's The Fountainhead. The essay was marked throughout by a conspicuous lack of proportion. To compare dams to nuclear weapons was absurd. To demonise technology was irresponsible. He's become like a stalker who shows up at my doorstep every other Sunday. Some days he comes alone. Some days he brings his friends and family, they all chant and stamp... It's an angry little cottag e industry that seems to have sprung up around me. Like a bunch of keening god-squadders, they link hands to keep their courage up and egg each other on - Aunt Slushy the novelist who's hated me for years, Uncle Defence Ministry who loves big dams, Little Miss Muffet who thinks I should watch my mouth. Actually, I've grown quite fond of them and I'll miss them when they're gone. It's funny, when I wrote The God of Small Things, I was attacked by the Left - when I wrote The End of Imagination, by the Right. Now I'm accused by Guha and his Ra-Ra club of being - simultaneously - extreme left, extreme right, extreme green, RSS, Swadeshi Jagran Manch and by some devilish sleight of hand, on Guha's side too! Goodness, he's skidding on hi s own tail! Take his book - his biography of Verrier Elwin. It's competent and cleanly written. But our political differences begin with his choice of subject - personally, I think we've had enough, come on, enough stories about white men, however inte resting they are, and their adventures in the heart of darkness. As a subject for a biography, frankly, I'm much more interested in Kosi Elwin, his Gond wife. And the title of his book! - Savaging the Civilized: Verrier Elwin, His Tribals, and India. His tribals! His tribals? For heaven's sake! Did he own them? Did he buy them? There's a bog, a marsh, a whole political swampland stretching betwee n us right here. But it's his other work, his history books - he calls himself an ecological historian, you know that, don't you? ...Guha's outburst is dressed up as an attack on my 'style' - but it's not really that at all. If you part the invective, you'll see that our differences are serious, and seriously political. Chittaroopa Palit of the NBA has done a wonderful dissection of Guha's politics in her article "The historian as gatekeeper" [Frontline, January 5, 2001]. My style, my language, is not something superficial, like a coat that I wear when I go out. My style is me - even when I'm at home. It's the way I think. My style is my politics. 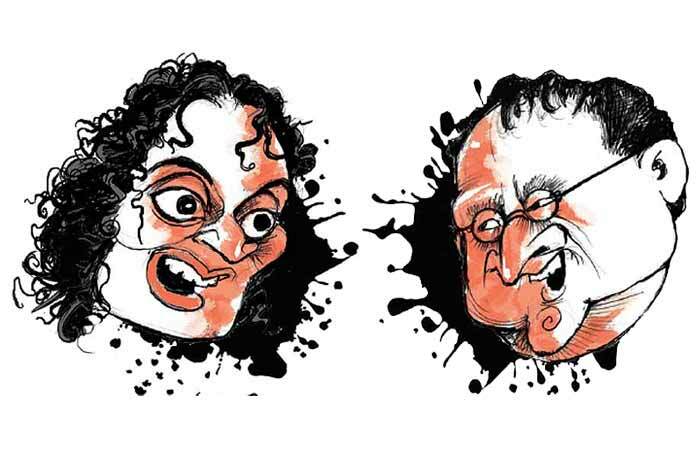 Guha claims that we - he and I - are 'objectively' on the same side. I completely disagree. We are worlds apart, our politics, our arguments. I'm inclined to put as great a distance as possible between the Guhas of the world and myself. ...Guha is guilty of flabby conclusions drawn from sloppy reading. Frankly, between his suspect politics and slapdash scholarship, a woman's spoiled for choice. Does anyone have the right to defame someone in such careless, wanton fashion? I think he owes me a public apology. "I guess my essay stemmed from three kinds of reservations. First, there was an aesthetic distaste for Arundhati Roy's hyperbolic style. I prefer a classical, elegantly understated and subtly ironic style: the silver dagger rather than the blunt iron hammer. Second, there was the worry of someone long involved with the environmental debate that the simplifications and exaggerations of Roy would tend to polarize issues and make meaningful environnmental reform that much more difficult. 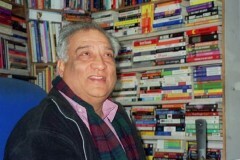 Third, there was the judgement of the historian, who had through his work come across such remarkable and public-spirited Indians as Shivram Karanth, Verrier Elwin, Mahasweta Devi and Kamaladevi Chattopadhyay, in comparison with whom Arundhati Roy is vain, self-regarding, and, in terms of content, shallow. I should also add that what I predicted in my original essay has been sadly vindicated. This is what I had written: 'Celebrity endorsement of social movements is always fraught with hazard. In the beginning it may attract media attention... However, the media will soon abandon the cause for the star...' Be it Outlook here or the Guardian there, the cause is forgotten -- the questions of sustainable technology and the rights of the tribals of the Narmada valley -- all they are interested now in is Arundhati Roy." Ramachandra Guha, liberal historian and founding member of the New India Foundation, a corporate-funded trust, advises us in his book—as well as in a series of highly publicised interviews—that the Gujarat government is not really fascist, and the genocide was just an aberration that has corrected itself after elections. Ironically, the insinuation that I am somehow an apologist for Hindutva comes in the very week that a BJP state government has formally accused me of being a sympathiser of the Communist Party of India (Maoist). Both claims are absurd. Anyone who reads my book India After Gandhi or my newspaper columns will know that I am a constitutional democrat who detests religious fundamentalists (as in the Hindutva-wadis) as well as political extremists (as in the Maoists). I have never written (or spoken) a sentence that can be construed as being even remotely in support of the present Gujarat government (or, for that matter, the Maoists). Arundhati Roy’s characterisation of the New India Foundation is equally false. This foundation was set up to encourage work on the history of independent India. Its founders include the eminent sociologist Andre Beteille, the editor of The Hindu, N. Ravi, and the entrepreneur and philanthropist Nandan Nilekani. It has been wholly funded by individuals, in particular, by six public-spirited Indians living in Bangalore. 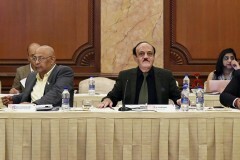 However, were the New India Foundation to accept corporate funds, it would merely be on par with that other literary-minded foundation, the Booker, founded by the Booker McConnell Corporation, a corporation known among other things for its harsh treatment of sugar workers in the Caribbean. It is dismaying that an established writer, herself the beneficiary of prizes and awards, should seek to disparage a modest Indian attempt to support and encourage younger and less established writers. The New India Foundation has thus far awarded 14 book-writing fellowships. Among the recipients are lawyers, journalists, scientists, social scientists, and (dare I hope Arundhati Roy will approve?) an activist of the Narmada Bachao Andolan. I can only pray that the other statements and arguments in Ms Roy’s article bear a closer resemblance to the truth.